Essex Libraries operates the Town Library in conjunction with Saffron Walden Library next door. Many people do not realise that they are two separate institutions. This is the Town Library today, a place for quiet study. Anyone is welcome to visit and to read the books. Many of the books are out of sight in the rolling stacks but you can find them by looking on the online catalogue "ELAN" or by asking the library staff for help. 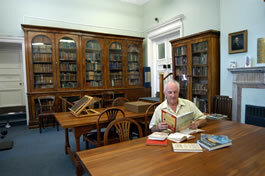 The reading room is a popular place for quiet study and many people consult the extensive local studies collection kept there.